"had several to play with today--3/4 of them would run , but no dynamic brake----started switching parts around with the few good electomech motors I have---turns out that the armatures on the bad motors were the problem---they tested fine on the growler ( no shorts)--but had higher resistance than the good armatures----my thought--when the electromech have a problem (due to bad brushes or contamination of the armature) they would lose dynamic brake--this causes the gear to go too far and hitting the stops in the trans---it then takes a higher current to get it to move off the stops--this higher current causes the armature to heat up--screwing it up someway. The lamb armatures are a more robust unit--even though some are 50 years old--you can tell someone took pride in what they were doing--I almost never find a bad Lamb armature--they just get worn down below service limits--this usually happens after 4 or 5 OHs." This is a picture of a data plate from an early Bonanza (circa 1947) gear motor---its a lamb motor made by Black & Decker! Why Continuing to Replace Gear Motor Brushes is not Such a Good Idea! This is a classic case of several motor brush replacements without a complete open up and cleaning and servicing of the motor. The motor's owner reported that it would not work every once in a while, it was slow on RPM, had little to no dynamic braking, and was low on torque. After cleaning the armature three times to get all the gunk out of it, installing new bearings, new brushes and running them in, this refurbisher returned the motor to smooth "sewing machine" operational status. 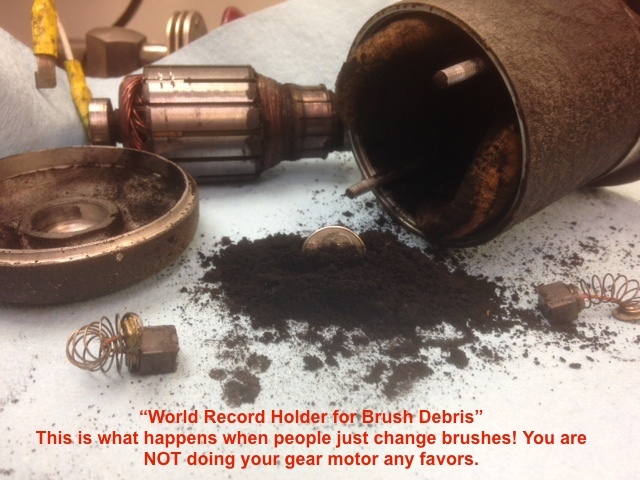 Below is the World Record Holder for gear motor brush debris. No folks, the brushes don't vaporize into a gas and escape out of the case! 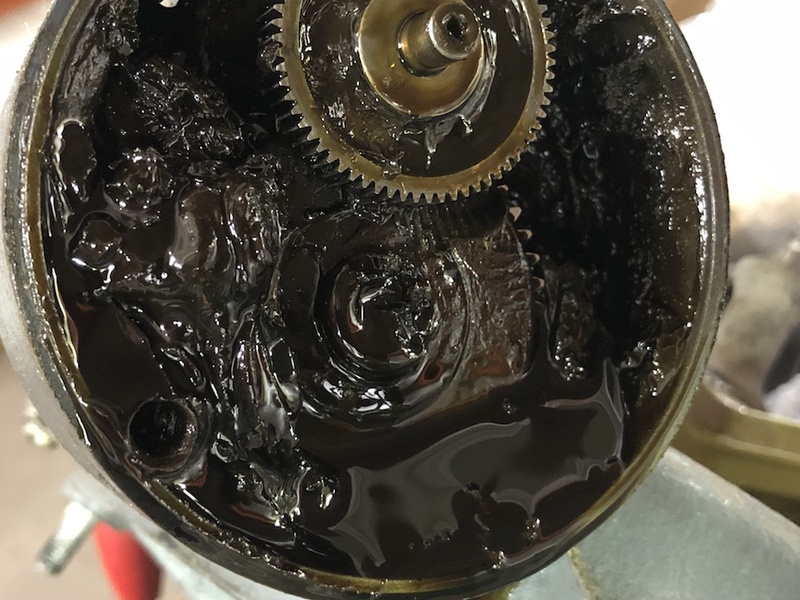 If you or your mechanic insist on overfilling the transmission, you run the risk of trashing your gear motor by having the gear lube enter the motor and then BAM, your fresh overhaul landing gear motor is fouled and then fails because your motor mounting flange looks like the one below. If your mechanic tells you he inspected the motor brushes and they looked good, ask if he looked at both of them because only one is easily accessed. Of course, if he completely removed the motor, both can easily be inspected. Let's Run the Gear Motor Brushes to Failure! The nose was all screwed up from where the nose gear failed. I tested the trans with the manual handle---stuck solid--thought the wreck might have screwed the sector gear ??? Took off the gear motor--then the trans worked perfect and smooth ??? This above picture is what I found when I opened the motor up. I'm sure the motor had been talking to the owner--His thoughts--if its not broke--don't fix it. Listen to your motor--speeds--dynamic brake , etc. and if its got over 1500 hours on it--HAVE IT CHECKED!" This is what a 50-year old 12V Bonanza flap motor looks like inside that has not been serviced in its 4000 some odd hours of airframe time. This is what a severely abused flap motor looks like. Running components like this to failure is really doing a disservice to the Beechcraft community. It removes a serviceable core from the market which makes replacements scarcer and more expensive! Folks, it doesn't have to be this way. 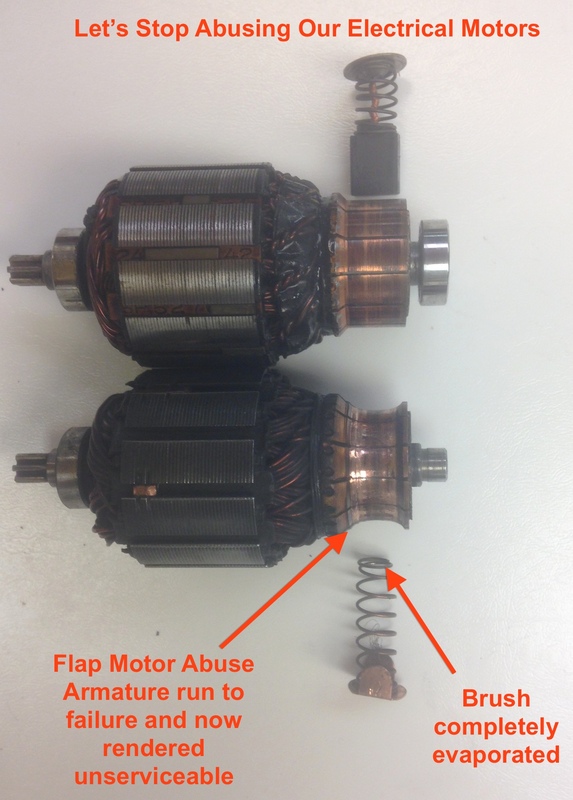 Don't let your electric motors get this bad before giving them the service they deserve.